A bride who controlled the grooms entire involvement in the wedding and even cancels his bachelor party in fear he will meet other women. Groomzilla who arrives late and drunk to the ceremony starts demanding to change the entire set up of the wedding. 2018 has been a revolutionary year for fashion and acceptance. The fashion world has taken on how diverse we are becoming and that is reflected greatly in the wedding community as people’s personalities mirror their wedding styles. Ever thought about a weekend long wedding, a pet friendly wedding or even starting the planning with a vibe, like Geometric & Retro, rather than a colour? 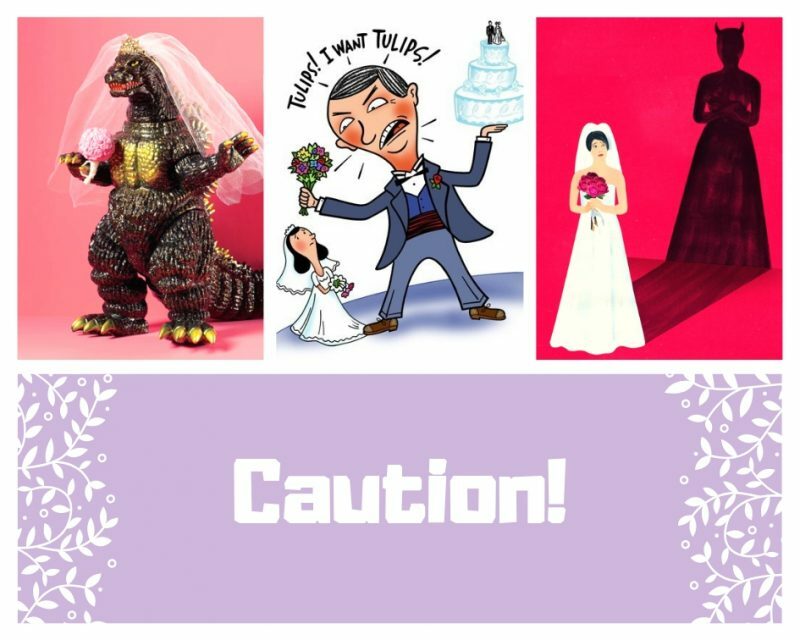 Trying to think of a wedding scheme can be one of the hardest parts of wedding planning. However this year has given us many good ideas for how to pull this off well. Pinks, greys, purples and black are a huge hit at the moment. Using neutral shades for most of the wedding really heightens the simple colour scheme of one bold colour for the big accents. Furnishings, flowers, cake and stationary can all be bright colours set against a background of neutral undertones. Pleasing all your guests can be difficult when it comes to food so switch to serving buffet style and save some pennies like 54% of 2018 weddings. Food themes are a huge hit this year: Indian, brunch, Mexican or even daring vegan menus. Taco and ice cream food trucks get people involved with food and have fun mixing dish flavours, or switch it up to a cute prosecco or cocktail truck which are making increasing appearances at events and festivals. Great Gatsby themes are very on trend right now including delicate finger sandwiches, macaroons, bitesize burgers and fruit. Bubblys always add class to the table at weddings so having a bottle of champagne or prosecco for your guests to drink will go down a treat. Maybe local craft beers, spirits and gins might also fit your theme? Cocktails are always popular, so a make-your-own cocktail stand will be a sure hit with your guests. Whatever you choose to serve, ice cubes with berries and herbs infused into them will put a smile on everyone’s face! As with all ideas involving alcohol, remember to discuss beforehand with your venue or negotiate it into your package so you don’t get vetoed by them on the setup day or stung with large corkage bills. Sleek and modern twists were a big favourite in 2018 cake designs. Geometric patterns radiate modern art deco and metallics like bronze and silver really compliment these themes. A simple wedding cake structure with marble and textured patterns bring subtle contemporary touches to 2018 weddings. Floral touches, be they real or sugar flowers, remain a timeless and versatile way to dress cakes this year. 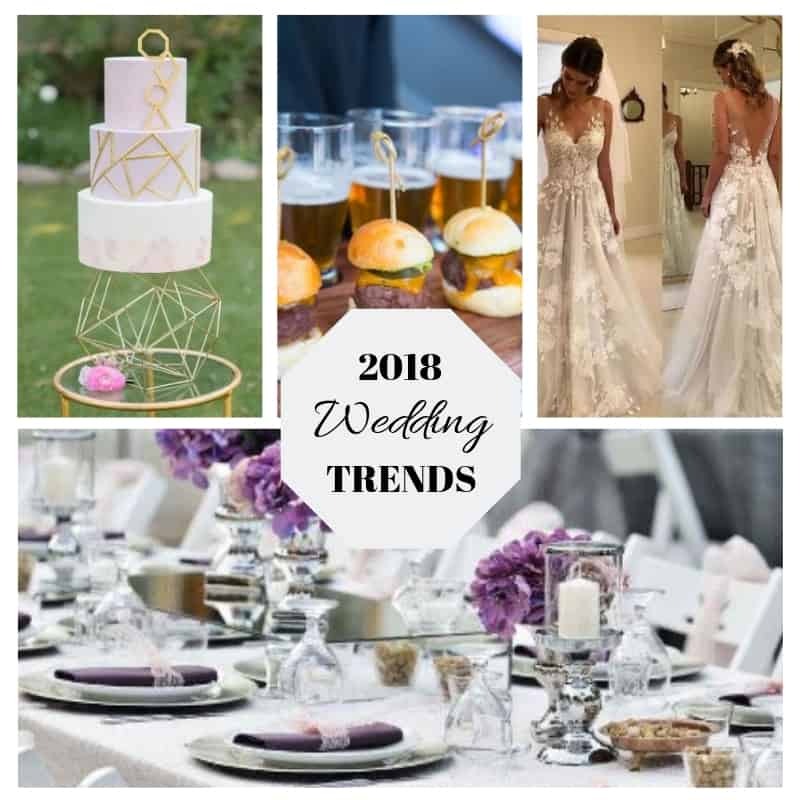 Stepping away from the traditional wedding dresses can be hard for some brides.However, in 2018 brides can pretty much wear whatever they like from princess style dresses to white tuxedos. Lace has stepped up a notch this year as bohemian style dresses have taken centre stage. Floaty and elegant silhouettes, incorporating fluted sleeves, open backs, drop waists and embellished mesh ooze sophisticated style on the catwalk. Coloured dresses are no longer an unseen thing with subtle pale pinks and even bold reds and black popping up. A new dress trend this year is personalised embroidered embellishments – coloured or white, flowers, birds, butterflies, leaves and petals – executed right can really be quite impressive.